12:56 a.m. — After receiving a report of a despondent man, police contacted Community Counseling to meet with the man. 1:41 a.m. — Investigating a fight in the 100 block of Harding Way East, police arrested a man for obstructing official business. 8:44 p.m. — A small porch fire was reported in the 100 block of Sixth Avenue. A resident said he think he put the fire out. Officers reported a very small burned area on the porch. 11:34 a.m. — Police received a report of two weiner dogs running loose in the 400 block of Euclid Avenue. Police spoke to the owner of the dog and advised them of the city’s leash law. 4:40 p.m. — Following a report in from the 800 block of Hess Street that a woman was threatening people with a knife, police arrested a woman for domestic violence. 5:27 p.m. — Police received a call from the 300 block of Wildflower Drive about a raccoon with a jar stuck on its head. The raccoon, despite the jar, managed to run away from the scene. 8:06 p.m. — A police received a call from Check into Cash, 703 Harding Way East and reported a man tried to cash a check — given to him by a man trying to buy his truck — and the check was fake. 8:26 p.m. — An iPad was reported stolen from a car in the parking lot at Geyer’s, 230 Portland Way North. 9:03 p.m. — Police received a ca from the 400 block of Portland Way North about a man who was threatening to hurt himself with a knife. The call c a.m. — e from Malin HealthCare, who was talking to the man at the time. Eventually, by tracking the man’s phone, he was found on North Market Street and taken to the police station to he could speak to someone with Community Counseling. 12:32 a.m. — Officers checked in a broken window at First Presbyterian Church, 240 S. Market St. Everything appeared to be OK.
8:18 a.m. — A car hit a parked car in the 600 block of Harding Way East. A citation was issued for failure to control. 9:56 a.m. — Police responded to a loud argument in the 500 block of Virgil Street. It was a verbal dispute and no citations were issued. 11:26 a.m. — 300 block of South Union Street. Police responded to a call of two kids beating up another young boy. It turns out the three were just messing around. 3:31 p.m. — Police responded to a report of someone in a vacant house in the 200 block of South Union Street. It turns out a real estate agent was showing the house. 5:21 p.m. — Police responded to a report of two men who appeared ready to get into a fight in the 100 block of First Avenue. One man apparently left before officers arrived. A second man was giving a verbal warning for disorderly conduct. 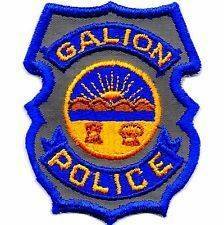 6:06 p.m. — Police went to Galion Community Hospital to arrest a man on a warrant out of Marion. The man left on foot, but was picked up near the Duke station on Ohio 598. 6:46 p.m. — Police received a report of a beige boxer running loose in the 200 block of Westgate Drive. They did not find the dog. 6:51 p.m. — Policed served a summons to a woman suspected of shoplifting at Discount Drug Mart, 739 Carter Drive. 7:27 p.m. — A resident in the 100 block of South Riblet reported that someone in the neighborhood broke down a fence and stole a motorized bike. 9:44 p.m. — Police responded to a report of a suspicion person in the 400 block of Harding Way East who had knocked on a door and asked for some water. The people at the home thought he was acting a bit odd. Police found the man, who said he was not feeling well, but declined EMS services. 1:51 a.m. — Galion police arrested a man on suspicion of DUI after following him to the 700 block of Charles St. The police report said the man was all over the road and almost hit a pole near the Rainbow Inn. 8:22 a.m. — Galion police arrested a man on a felony warrant from Richland County in the 500 block of Sherman Street. 5 p.m. — Police responded to a report of a man looking into cars in the 800 block of Harding Way East. Officers talked to the man, who said he was just looking. 10:09 a.m. — Police responded to a domestic dispute in the 100 block of Lutz Court. No citations were issued. 7:36 p.m. — Police responded to an accident in Heise Park in which one vehicle reportedly lost a bumper. A citation was issued for driving under suspension and improper backing. 7:29 a.m. — Officers investigated a report of suspicious persons in the 800 block of Beverly Dr.
10:23 a.m. Officers transported a female to jail for Adult Probation in the 1400 block of Cullen Ave.
11:17 a.m. A resident in the 1400 block of Woodlawn Ave. reported a generator stolen from his vehicle. 1:45 p.m. A private property accident report was taken in the Walmart lot. 3:00 p.m. An E. Rensselaer St. resident reported a generator stolen. 3:42 p.m. Officers assisted the staff at Bucyrus Community Hospital ER with a patient. 3:59 p.m. Officers conducted a welfare check in the 1600 block of Marion Rd. 4:08 p.m. A report of 2 teenage boys mishandling a canine in the 1200 block of Monnett St. was investigated. 5:04 p.m. Officers assisted a male in the 200 block of S. Lane St. with some issues he was having. 5:32 p.m. Officers talked to a citizen on station about a possible internet theft. 6:01 p.m. Officers investigated a hit-skip accident in the 1300 block of Woodlawn Ave.
6:36 p.m. Officers conducted a welfare check in the 900 block of Monnett St.
7:17 p.m. A 16 year old boy was arrested for shoplifting at Kroger. 7:26 p.m. A report of a male talking of suicide in the 500 block of Failor St. was investigated. 7:50 p.m. A report of a male talking of suicide in the 1700 block of Marion Rd. was investigated. 9:34 p.m. A report of people on the roof of a business in the 100 block of S. Sandusky Ave. was investigated. They were given a warning. 10:21 p.m. A report of a domestic issue in the 200 block of W. Lucas St. was a verbal dispute. 10:50 p.m. Officers assisted two females in the 1500 block of N. Sandusky Ave. who claimed they were being followed. They were escorted home. 11:03 p.m. A report of a disorderly patron at a downtown establishment. 11:15 p.m. Officers responded to an overdose in the 200 block of Hopley Ave.
1:40 a.m. A resident in the 800 block of Wingert St. reported people banging on his door and yelling at him. 1:50 a.m. Officers mediated a domestic issue in the 500 block of Failor St.
2:26 a.m. Officers responded to a disturbance in City Lot 3 and one individual was arrested for aggravated menacing and disorderly conduct. He was taken to the Crawford County Justice Center to be held for a court appearance. 4:11 a.m. A disturbance at the Horseshoe Bar was investigated. 4:16 a.m. A report of a male trespassing in the 100 block of E. Liberty St. was investigated and the subject left the area. 6:07 a.m. A truck driver reported fuel stolen from his vehicle while parked at Sunoco. 9:05 a.m. — Officers checked a residence for a possible burglar. No one was located. 9:13 a.m. — A report of a small child alone at the intersection of Lane and Rensselaer St. was investigated. 9:23 a.m. — A subject reported her wallet stolen from her purse in the 200 block of S Walnut St.
11:23 a.m. — Officers made a welfare check for Community Counseling. 2:36 p.m. — Officers checked for a possible subject driving under suspension in the area of Norton Way. 3:34 p.m. — Officers checked a juvenile complaint in the 500 block of E. Rensselaer St.
3:40 p.m. — A report of a domestic dispute was taken at the Police Department. 4:10 p.m. — A domestic dispute was investigated in the 800 block of Woodale St.
4:23 p.m. — A report of a person shoplifting at CVS was reported. 6:24 p.m. — A woman, 37, was arrested in the 100 block of W. Mansfield St. for possession of drugs. She was issued a court date and taken to the Crawford County Justice Center to be held. 6:53 p.m. — A theft report was taken in the 1300 block of High St.
8:03 p.m. — A report of a possible domestic was reported on S. Sandusky Av. 8:15 p.m. — An assault report was taken in the 500 block of S. East St.
10:38 p.m. — A breaking and entering in the 500 block of Garnet Court was investigated. 12:19 a.m. — Officers investigated a disturbance in the 400 block of Wallace Ave.
1:55 a.m. — Officers investigated a disturbance in the 100 block of Washington Square. 6:12 p.m. —Crawford County deputies from the Crawford County Sheriff’s Office responded to a one vehicle roll-over, injury crash at the intersection of Mount Zion Road and Wyandot road. Members of the Bucyrus Township Volunteer Fire Department and Life Support ambulance Service were dispatched. According to the sheriff’s office, Anthony D. Dillow was driving lost control of a 2007 Suzuki Forenza on Wyandot Road, flipped end over end and come to rest on it’s top in the middle of the intersection. Dillow and a nine-year-old passenger were transported by the ambulance to the Bucyrus Community Hospital for minor injuries where they were treated and released.